The book is a valuable and fun tool for the liveliest rarity hunters, while transforming them into rare bird predictors. This is an extraordinary way of listing bird collections, as it documents bird groups by order rather than by genus and species, which is further invigorated with illustrations. The key to identifying birds is to understand the 29 different sub groups they fall into (ie. "orders"). These 29 orders, each have characteristics that differentiate them from the other orders. Birds of Prey for example are in a different order to Owls. Both might be carnivores, but there are other things that are different in each of those groups. 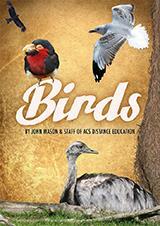 The 'Birds' ebook shows you those differences and is a great foundation to identifying birds. This book contains 117 pages and around 130 different bird species are illustrated, including at least one representative from each order.